Darjeeling, Aug. 7: Home secretary Basudeb Banerjee today said the GTA Sabha was functioning well and the state government had extended all support to the autonomous hill body since its formation in August 2012.
government interfered in the functioning of the GTA. Later in the day, Morcha chief Bimal Gurung rubbished Banerjee’s assertion that the hill body was working well. The home secretary also said the Morcha leadership was fully aware of the issues involved regarding the transfer of the departments from the state to the GTA. “We had published a compendium on the transfer of departments detailing everything,” Banerjee said. According to the GTA Act, the state government has to transfer 37 departments to the hill body. The Morcha has often complained that the departments were not handed over to the GTA completely. Banerjee today also held a meeting with R.D. Meena, the principal secretary of the GTA, and discussed development work being carried out in the hills. 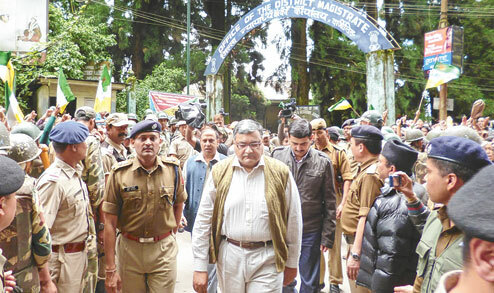 The home secretary who visited the Darjeeling superintendent of police’s office near Raj Bhavan decided to take a five-minute walk downhill to the district magistrate’s office, the entrance to which had been crowded by thousands of Morcha supporters since early morning. Police cleared a corridor to allow an easy passage for Banerjee who briefly visited the DM’s office before walking back to the SP’s office to take a vehicle down to Siliguri. As Banerjee entered and left the DM’s office, people shouted “we want Gorkhaland”. Morcha leaders had also complained earlier that the GTA was not being allowed to function autonomously and it had to seek permission from the state government on every matter.